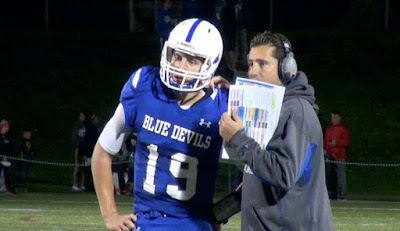 The inside track to the Mid-Wach A title and a playoff spot will be on the line when Leominster hosts undefeated Wachusett in its home opener. Ed. Note- Our Massachusetts football guru John Sarianides is back with five games to watch during Week 4 of MA high school football. Here are the biggest games of the week. The Kelley-Rex Division of the Hockomock League is up for grabs on Friday night as the King Philip Warriors (3-0) visit the Mansfield Hornets (2-1). Mansfield has turned things around after a 44-3 loss at Calvert Hall to start the season. The Hornets beat Braintree 34-10 in Week 2, then beat Attleboro 38-7 last week. Mansfield coach Mike Redding is back to running his familiar two-back Wing-T offense, after opening the season in the spread. For the Warriors, it’s all about their stellar defense and running game. If KP can force some three-and-outs early and establish their ground game, they should be in good shape. Weather will be a factor in this one and, with both teams being physical, expect a low scoring game. Natick will be looking to bounce back after a 21-0 loss to Wellesley last week. The Raiders were able to shut down Natick’s Dead-T offense, and they forced the Redhawks to throw the ball more than they wanted to. Milton will take a similar approach this week defensively. Offensively, the Wildcats haven’t missed a beat. While they might not have the talent they had last season, the Wildcats still have enough athletes to make Steve Dembowski’s spread offense work. Natick usually plays good defense, and they have the athletes to play with the Wildcats. If Natick can run the ball and control the clock, they’ll give themselves a chance to win this game. Leominster needs to bounce after losing to BC High 36-0 last week. The Blue Devils were outplayed in every phase of the game. Getting shut out obviously stings, but if you are head coach Dave Palazzi, you have to be disappointed by the performance of your defense. Leominster has too much experience on the defensive side of the ball to play as poorly as they did. Bouncing back will be tough against a Wachusett team that has scored 105 points, and has wins over Fitchburg and Shepherd Hill on its resume. Leominster needs to get off a good start offensively in this game. They can’t fall behind the way they did last week. Wachusett is physical up front, and they can run the football using a diversified ground game. Leominster has to go into this game hungry and ready to get back on track. They cannot underestimate the Mountaineers. With Kevin Mensah now in the fold, the Rams are ready to turn things around and get their season on track after an 0-3 start. It won’t be easy with a visit to undefeated Algonquin, but the Rams running game had a different look last week with Mensah. Shepherd Hill now has that dynamic, explosive running back that can break runs and finish drives. This is a make or break game for Shepherd Hill. If they want to make the playoffs, they need to have this game. After a tough loss to B-R two weeks ago, the Hawks bounced back with an impressive 49-0 win over Barnstable. Speaking of impressive, CM had an impressive win over Brockton last week, 34-0. The Knights appear to have turned the corner now are a legit threat in Division 1 South. This will be the measuring stick game for them, however. If they can find a way to shock the X, they will have arrived. In order to do that, the Knights need to take a page out of B-R’s playbook. Pound the ball and control the clock, then bring pressure on defense. If the Knights can do that, they’ll give themselves a chance to win this game. Billerica v Everett should be a brawl!!!!!! That should be a great one too. I'll be there filming highlights!